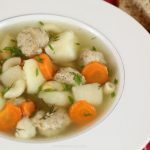 A nice, light and refreshing meatball soup also known as суп с фрикадельками, is one of the many popular soups served in the Slavic culture. 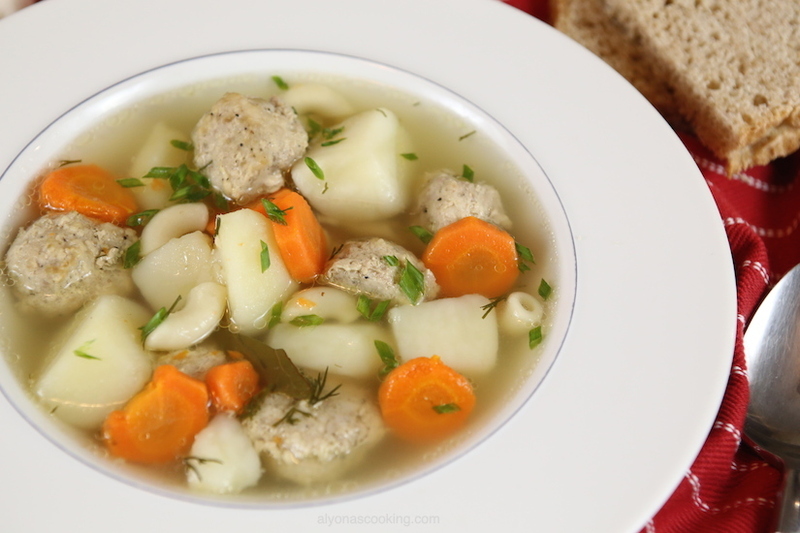 You don’t have to be Slavic to try this soup as some commonly used ingredients are used to make this delicious soup! This recipe is very easy and quick to make as no frying or sautéing is required. 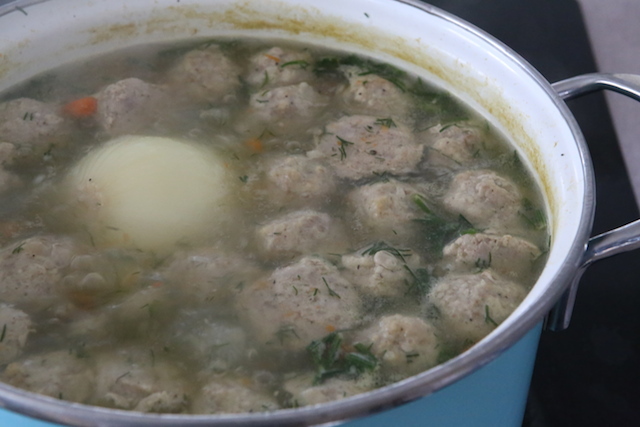 Baking the meatballs strengthens the meat so they don’t fall part on you in the water and leaves for a cleaner stovetop as there baked in the oven instead of fried. The results come out delicious without any complicated steps or extra dishes to wash. 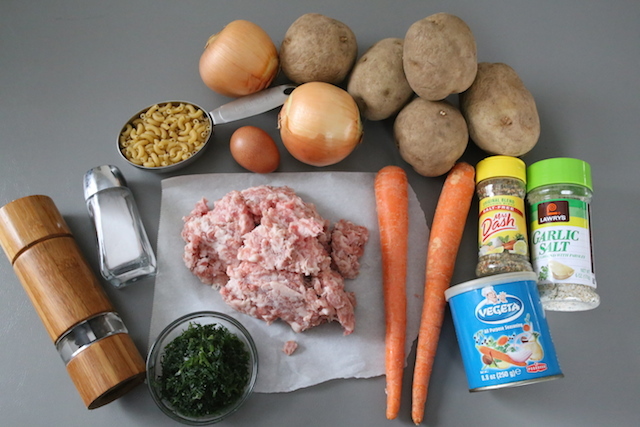 It happens to be very versatile so feel free to substitute rice for pasta or ground chicken for pork and etc… Enjoy! In a large pot bring 12 cups of water to a boil. Preheat oven to 400 degrees F and line a baking sheet with aluminum foil; set aside. 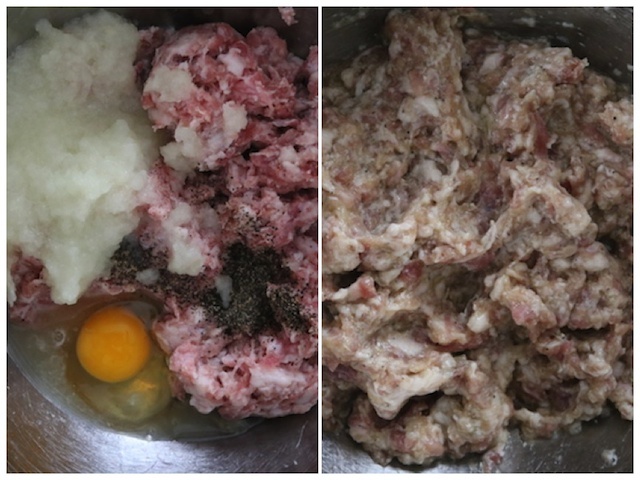 In a medium sized bowl combine the meatball mixture and mix to combine well. 5. Peel and wash the potatoes, carrots and onion. 6. Cube the potatoes, chop the carrots and leave the onion whole. Tip: I like to leave one end of the onion for an easier grip when grating, that way the onion doesn’t slide all over the grater. 7. Once the water boils add the whole onion, potatoes and bay leaves; boil over medium heat for 10 minutes. 8. Then add the pasta, carrots and seasonings and boil another 10 minutes. 9. After the carrots have boiled for 10 minutes add the meatballs and boil for 5 minutes. 10. 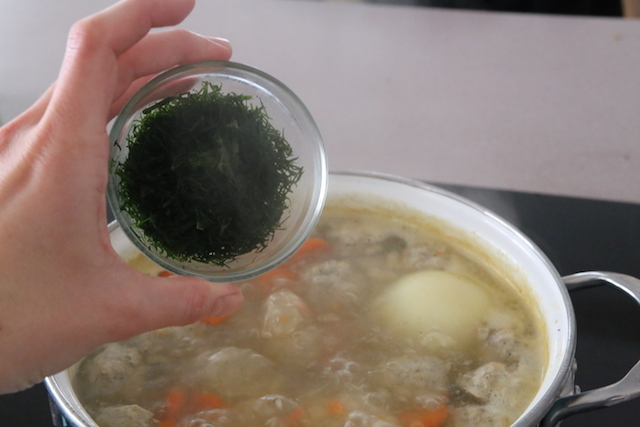 After 5 minutes add the dill and turn off the heat. 11. Cover soup and keep warm until serving. 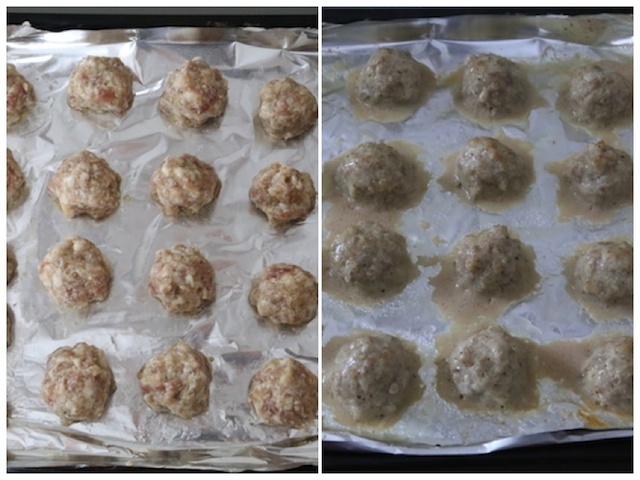 Shape meatball mixture into heaping teaspoon full balls and place onto the prepared baking sheet (makes about 29 meatballs). Bake for 10 minutes. Turn off oven and set meatballs aside until needed. Peel and wash the potatoes, carrots and onion. 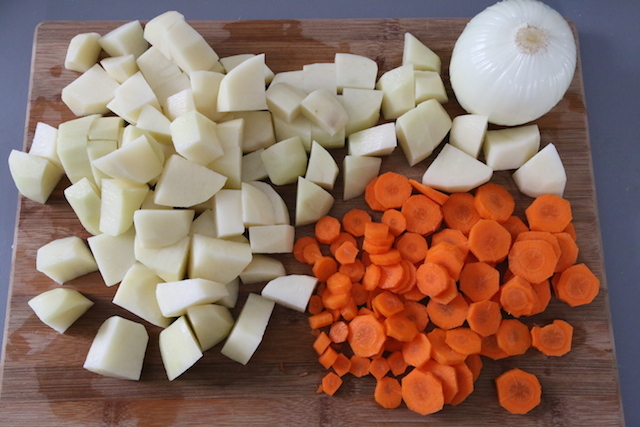 Then cube the potatoes, chop the carrots and leave the onion whole. Once the water boils add the whole onion, potatoes and bay leaves; boil over medium heat for 10 minutes. 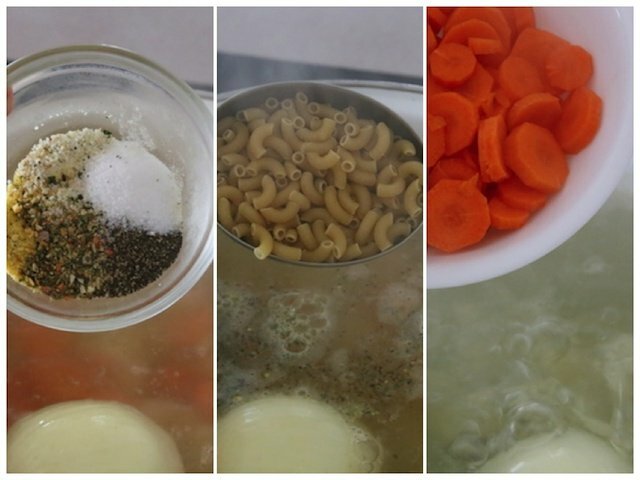 Then add the pasta, carrots and seasonings and boil another 10 minutes. After the carrots have boiled for 10 minutes add the meatballs and boil for 5 minutes. After 5 minutes add the dill and turn off the heat. Cover and keep warm until serving. 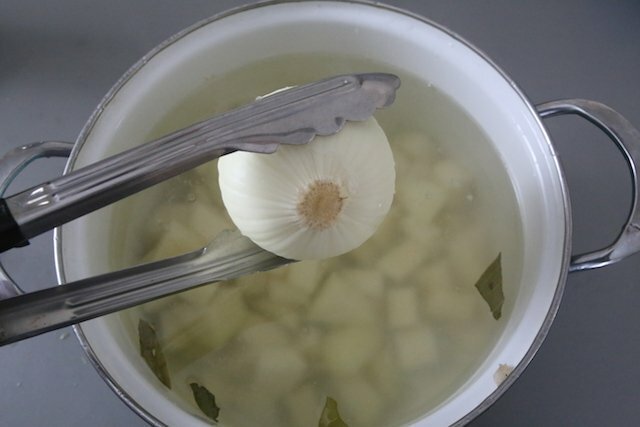 What do you do with the whole onion after the soup is done? 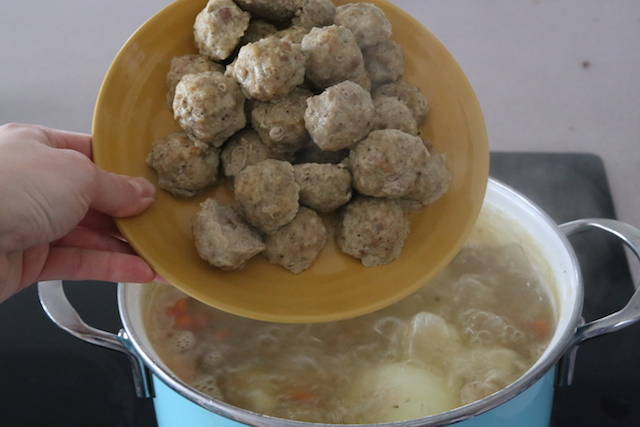 Meatball soup? Hi Susan, you can discard the onion once the soup has seeped in most of the flavors (preferably once cooked and completely cooled.) Or just leave it in the soup, it’s mostly there for the flavor.